This page: Ten Sleep, Hunt Expedition. 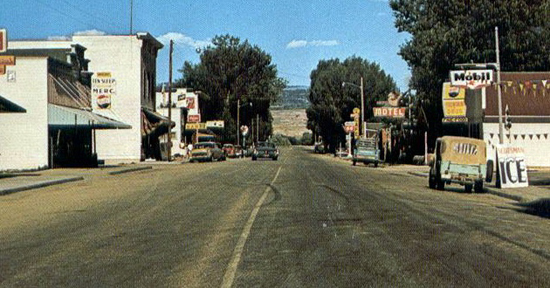 Twenty-eight miles to the east of Worland is the dozing little town of Ten Sleep, settled about 1882. 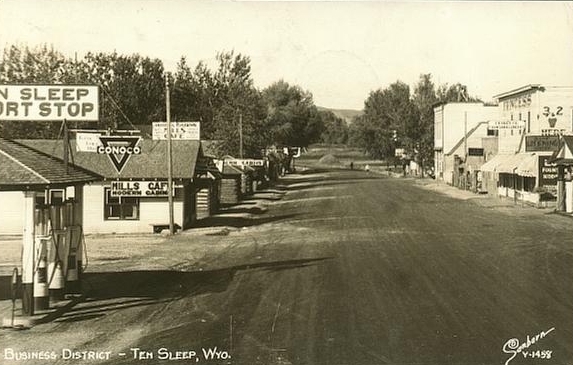 Ten Sleep allegedly received its name by being a ten days (sleeps) journey from Indian camps on the North Platte near present day Casper and near present day Bridger, Montana, on the Clark Fork. Since the journey took twenty days, the half way point was near the present town. The above wooden building was constructed by Henry Thomas Church in 1905. 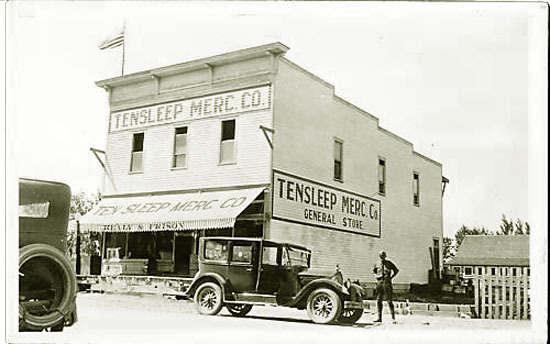 Upon, Church's death in 1919, the property was acquired by Alex Healy of Buffalo and operated with Church's son-in-law Paul Frison (1893-1989), as indicated on the awning, as Healy and Frison. 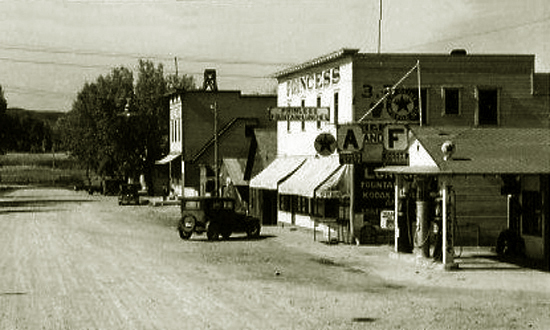 Frison continued to operate the Mercantile until 1943. Paul Frison served as a justice of the peace, state legislator and town mayor. Frison was also a local historian. The building is on the National Register and is a trip back in time with its tin ceilings and narrow aisles between the merchandize. 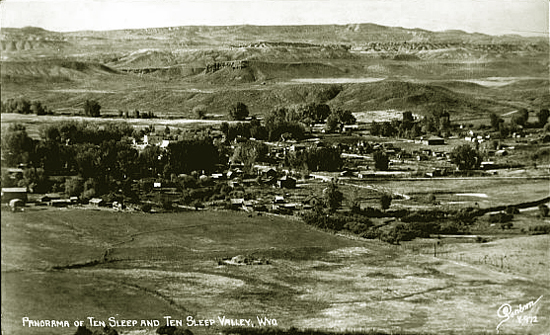 Although, In 1810, merchant Wilson Price Hunt's expedition to Oregon passed near present day Ten Sleep and along the Nowood Valley, the area was not settled until the 1880's and 1890's. The Hunt was a member of the Pacific Fur Company. As a guide, Hunt proved to be somewhat inept. He attempted a short cut leading the expedition into an area with so little water that even one of the expedition's dogs died of thirst and the Company was reduced to eating coyote. After passing into present day Idaho, Hunt then attempted to raft down the Snake and as a result lost his supplies and equipment. Of the 59 persons in the expedition, only 35 made it to Oregon. On the 22nd we ran into what we thought to be the usual route of the Absaroka [Crow] Indians coming from the Mandan villages. The little river beside which we camped and which flowed north was doubtless a tributary of the Powder River. On the 23rd we found another branch; but before we got there we passed through some mountains and some dry gullies. The great heat, the treacherous trail, and the lack of water caused much suffering. Several people were at the point of losing their courage. Mr. [Donald] McKenzie's dog died from exhaustion. While trudging through these barren, arid mountains we could no longer kill buffalo, for they usually keep near water. However, on the 25th we found a few in this area. The hunters stalked them and killed five. The day before, some of the company had eaten a wolf, which they found quite good. We made camp near a third tributary of the Powder River. A second expedition by the Pacific Fur Company went by ship. It fared little better. Two small boats were lost attempting to cross the bar at the mouth of the Columbia. The captain and crew sailed away before all stores were unloaded. The ship was attacked by Indians at Vancouver Island and blown up. In 1864, fifty-four years after Hunt passed through the area, Jim Bridger laid out the Bridger Trail passing near the present site of Ten Sleep for freight wagons heading to the gold fields of Montana. The trail headed out from Red Buttes, skirting the south end of the Big Horn mountains to Bad Water Creek. From there it proceeded over the Bridger Mountains and down to the Bighorn to Nowood Creek to the Greybull where it crossed at Big Bend and from there up into Montana and Virginia City. In the one year, 700 wagons, 1000 head of livestock, and a full twenty-five percent of the population of Virginia City followed Bridger's trail. The following year, however, the Army closed down the trail in favor of the Bozeman Trail. The Bozeman, however, as a result of the Treaty of Ft. Laramie was, itself, closed down in 1868. Thereafter, until the 1880's, access to Virgina City was an arduous trek either by steamboat to Fort Benton and then by ox train or stage to Virginia City, or a circuitous via way of Utah. Even though the steamboats drew only 18 inches unladen and no more than four feet fully laden, the trip was difficult and because of shoaling and low water, the vessels could make it as far as Fort Benton only for several months in the spring when the river was high with snow melt. The first church in the Ten Sleep was constructed in 1904 and dedicated on January 8, 1905. Local citizens raised $600.00 and also received $300.00 from the Extension Society of Philadelphia, an arm of the Methodist Church. The lumber was donated by Milo Burke. 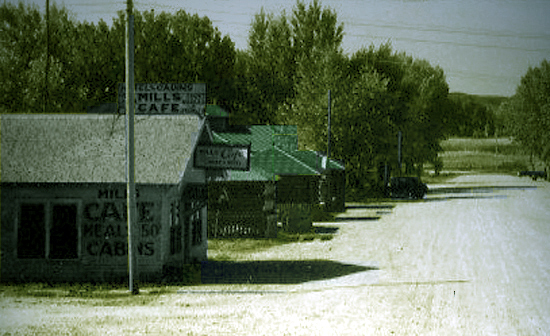 In 1910, the town was officially platted. About ten miles to the south of Ten Sleep is the site of the "Spring Creek Raid" discussed with regard to sheep. The above scene is directly across the street from the previous scene. Next Page, Ten Sleep Canyon.